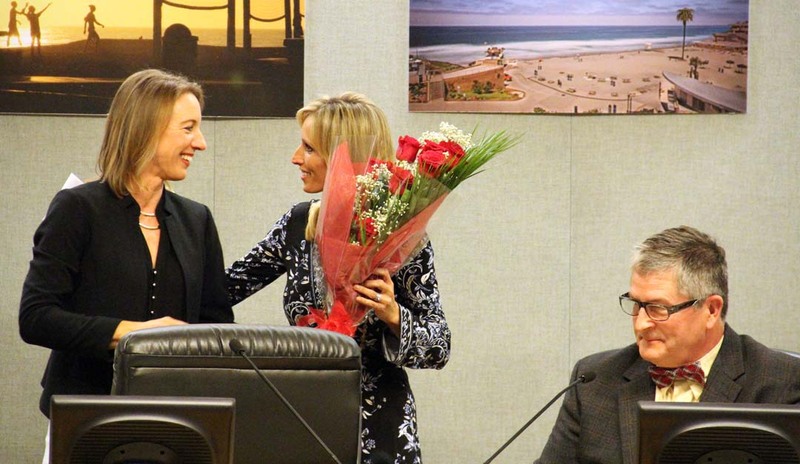 ENCINITAS — A standing room only crowd in Encinitas City Council chambers laugh, cried and applauded as they said goodbye to Mayor Kristin Gaspar and Councilwoman Lisa Shaffer and watched as Mayor Catherine Blakespear and the new council were sworn in. By the end of the night, the new City Council had unanimously voted for Tony Kranz to serve as deputy mayor and to start the process of appointing a fifth member to fill the remaining two years of Blakespear’s council term. And in between, outgoing County Supervisor Dave Roberts extended a proverbial olive branch to Gaspar, who defeated him for the Dist. 3 supervisor seat, as he pledged to work with her as she transitions into his seat in January, and also conveyed the county’s declaration of Nov. 13 as “Lisa Shaffer Day” countywide. The night began with friends, family, former and current elected officials and stakeholders praising the outgoing duo of Shaffer and Gaspar. Shaffer did not seek re-election after a single term. The two were showered with flowers and other gifts and knickknacks, including several that drew laughs from the crowd. Danny Salzhandler, president of the 101 Artists Colony, gave Shaffer a large book entitled “Pacific View Improvements,” a nod to Shaffer’s support of the elementary school site purchase and active role in the upkeep of the site, and brought Gaspar a giant calendar so she could keep up with her busy schedule as supervisor. Roberts also spoke during the public comment period. He offered himself of service to Gaspar in his new role as private citizen, and said that the transition thus far has been very smooth. Several people commended Roberts for his graciousness following the meeting. The City Council then honored the outgoing members with two PowerPoint presentations highlighting the strengths of Gaspar and Shaffer. Councilman Mark Muir commended Gaspar for her strong devotion to her family, her versatility and her passion for community service. Tony Kranz likened Shaffer, with whom he campaigned with successfully in 2012, to Dr. Seuss’ “Lorax” character, who spoke for the trees. 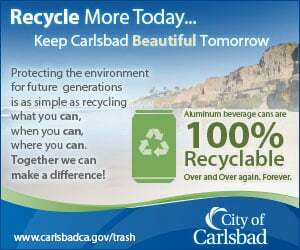 Kranz said that Shaffer’s passion for the environment and willingness to speak her mind would be missed on the council. Blakespear commended Gaspar for her ability to run meetings, and also said that her experiences were largely positive, even after a bitterly contested mayoral race in which she defeated Gaspar’s husband, Paul. She also praised Shaffer’s wealth of experience and knowledge that she brought to the council, which she said will create a void that the new council will be hard pressed to fill. Shaffer and Gaspar then addressed the crowd with emotional farewell messages. “Thank you is the simplest thing to say,” Shaffer said before acknowledging staff and the community and reading a farewell poem. “Plastic bags are no longer, e-cigarettes banned, commissions have new faces and power,” she said in one of the stanzas. “Bars get more scrutiny, no so out of hand, Moonlight Beach will soon have a new tower. “I am leaving the council in excellent hands, thanks to Catherine, Tasha and Tony,” Shaffer continued. “And Mark of course, with open space planned, and Karen who won’t take any baloney. Shaffer choked up as she read the final stanza of the poem. Gaspar followed with a tear-filled address in which she thanked her family, city staff, the council and the community, who supported her during her six years of service. She urged the public to approach the newly seated council with an open mind. After Shaffer and Gaspar collected their gifts and left the dais, City Clerk Kathy Hollywood administered the oath of office to the new mayor and three council members- Muir, Kranz and Tasha Boerner Horvath, a former planning commissioner. The council quickly moved to name Kranz, the highest vote-getter in the election, the deputy mayor, and voted to start the appointment process to fill Blakespear’s vacancy. Two people — “No on T” committee chair Bruce Ehlers and former Mayor Sheila Cameron — urged the council to appoint Tony Brandenburg, who finished in fifth place during the election but, more importantly in their mind, was the lone candidate to oppose the housing element ballot measure, which failed on Nov. 8. The council declined to make an immediate appointment, but said they would accept all applications. Persons interested in applying for the council seat can find the application by visiting the city’s website at encinitasca.gov. Applications are due Jan. 4. Hollywood said the council would tentatively interview the candidates at the Jan. 18 council meeting and could also host a special meeting on Jan. 25 if the council needed more time to decide on a candidate. If the council is unable to agree on a candidate after 60 days, the city would be required to host a special election.